Age – often paediatric, immunosuppressed or elderly. Time/date of onset. Systemic symptoms. 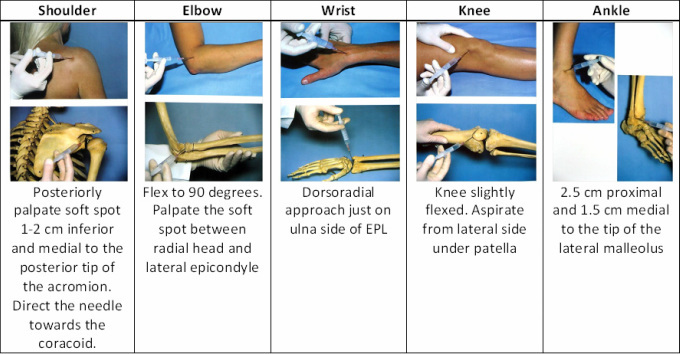 Joint aspiration with microscopy and culture of joint fluid is diagnostic. Ultrasound is useful and an aspiration can be performed at the same time, especially for deeper joints like the hip. 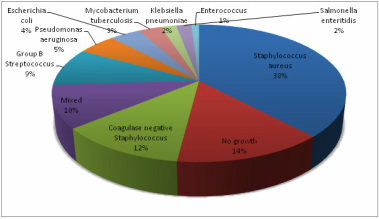 Aspiration MUST be done under sterile conditions to ensure infection is not introduced. Acute osteomyelitis. The two may co-exist in young children - the treatment is the same. If blood tests, examination and clinical picture support septic arthritis, it is an EMERGENCY. Senior doctors must be informed and the patient prepared for urgent joint washout. Delay to surgery will lead to greater destruction of joint cartilage. URGENT surgical drainage and washout. A further washout may be needed if symptoms do not settle within 24-48 hours. Intravenous antibiotics may be converted to oral antibiotics once signs of sepsis have resolved and then continued for 6 weeks.